The proximity of the hut to the Cobham campsite and picnic spot mean that you cannot be assured of any privacy. Do not leave valuables lying around unattended! 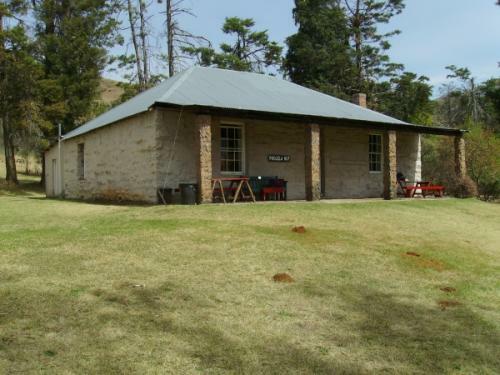 This old building was a farmhouse before the property was taken over by the state and put under the control of the old Department of Forestry, who then turned it into the first overnight hut on the Giant's Cup Trail. It has now been equipped with gas geysers, but the old wood stove can still be seen in the kitchen. There are internal and external ablution facilities and a free-standing boma. The rooms are carpeted - a nice feature because they can get very cold on a dull day. The rooms are equipped with bunk beds, mattresses, small tables and benches, and there are larger tables in the dining area and outside on the veranda. Some rooms have fireplaces, but you will need to buy wood at the office, which is just 200 metres away and also stocks a small supply of soft drinks, sweets and snacks. The hut has hot and cold running water. The Pholela River is within easy walking distance, and there are some nice chutes and ponds to wallow in near the suspension bridge, but take care when the river is high! This "hut" provides the shelter of a normal house, except that it is a bit more public! 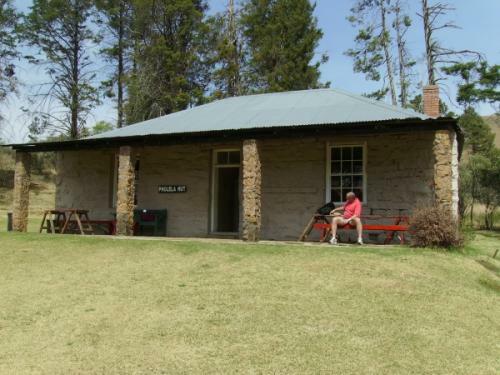 The hut is situated in park-like grounds with a fine view - if you can see past the trees - of the Giant's Cup (Hodgson's Peaks) after which the trail is named. It will appeal especially to those who don't like to be too far from the maddening crowds, like to have a shop nearby, and enjoy watching the world go by. You can even park your car conveniently close.